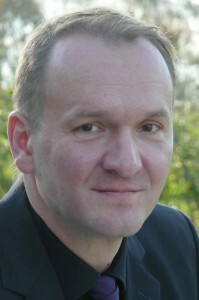 Markus Mühling is professor Systematic Theology & Philosophy of Religion at Leuphana University of Lüneburg. His interests are among other things relational-narrative Trinitarian theology, theological anthropology in dialogue with biological and social anthropology as well as the dialogue between the natural sciences and theology. As stated on his own website Mühling sees interdisciplinary dialogue as “a genuine task of systematic-theological work, since Christian acting and thinking – based on the Trinitarian conception of God, is related to the whole of reality and since Christian faith implies the tolerance of faith in a pluralistic Society”. As his book Resonances: Neurobiology, Evolution and Theology (2014) shows, Mühling has a strong interest in the conversation between evolutionary theory and Trinitarian and relational theological approaches. Particularly his work to explore convergences between constitutive-relational approaches in biology and a relational-narrative theological ontology finds our strong interest. His recent T&T Clark Handbook of Christian Eschatology (2015) in which he opts for a relational understanding of human becoming, emphasizing the dimension of the future and understanding Christian practice from the perspective of expectation, and in which he takes up a theology of creation as an order of love and an understanding of human being as creaturely love, has caught our attention as well. Markus Mühling has published extensively. Among his many German publications, we highlight the books Liebesgeschichte Gott. Systematische Theologie im Konzept (2013) and Gott ist Liebe. Studien zum Verständnis der Liebe als Modell des trinitarischen Redens von Gott (2005).